First off, let me start by saying that this has been a crazy hectic week. However, I made it through, have arrived at the weekend, and I intend to relax. It is sunny and warmer today (finally), so I will be doing laundry and hanging it on the line, but I don’t have any other major projects planned for the weekend. I am taking a bag of donations to Southern Thrift today after my daughter’s soccer game. And I will be photographing some new items to post on eBay later this week. And I plan to go for a 4-5 mile run later today. But other than that, I plan to relax. I have a brand new (to me) book about feng shui burning a hole in my e-reader! Here is another photo. Notice how there is lumber piled under the table. This is for a project that I am planning, and since we don’t have a garage or outdoor storage area, this is where is has been living since I bought it a year ago! 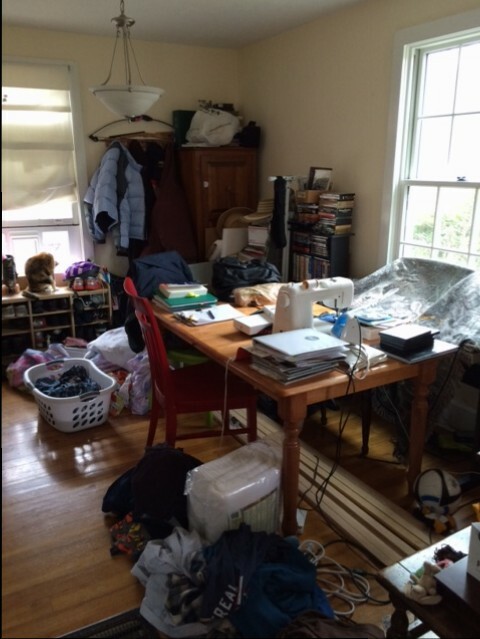 I actually completed this decluttering project last weekend, but am just getting around to writing about it. 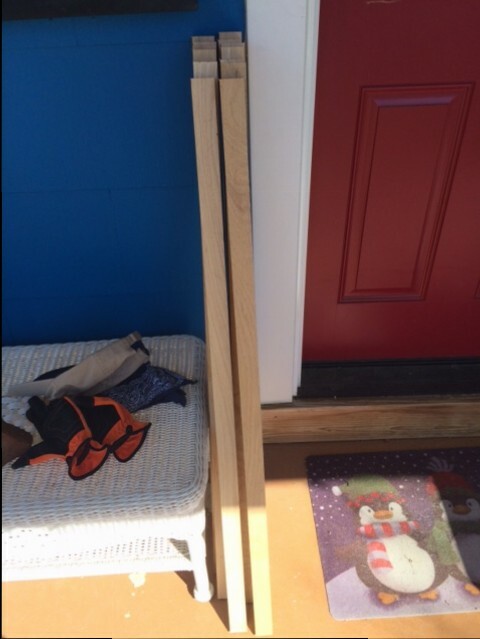 First, I removed all the lumber from underneath the table and took it out on the front porch. 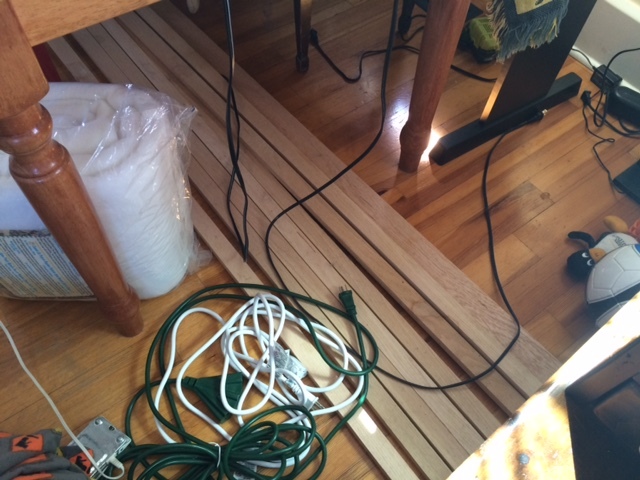 You might be able to see in the picture that there was also a miter saw under the table as well. I took it out on the front porch too. My husband packed away the extension cords and lights and put them in the attic. I took the quilt batting upstairs into the sewing room until I am ready for it. 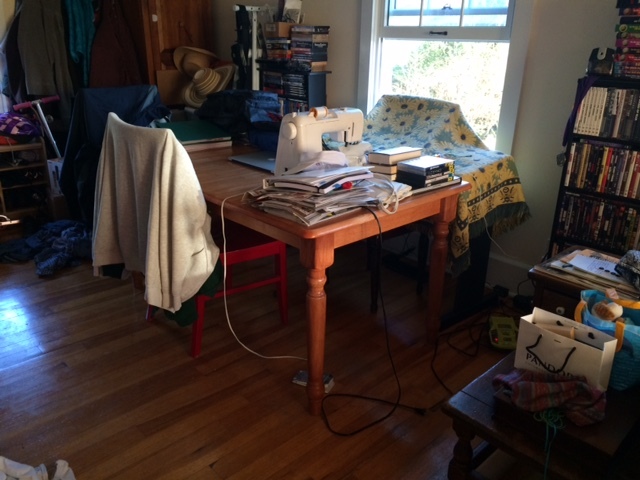 The sewing machine cover stayed under the table – I refuse to put away the sewing machine until I have completed the Christmas quilts for my parents! Putting it away will be my reward. Sad, yes? I bought all the stuff to clean it and repaint it, including new lumber for the seat, last year. But I couldn’t get the bolts off because they were all rusted. 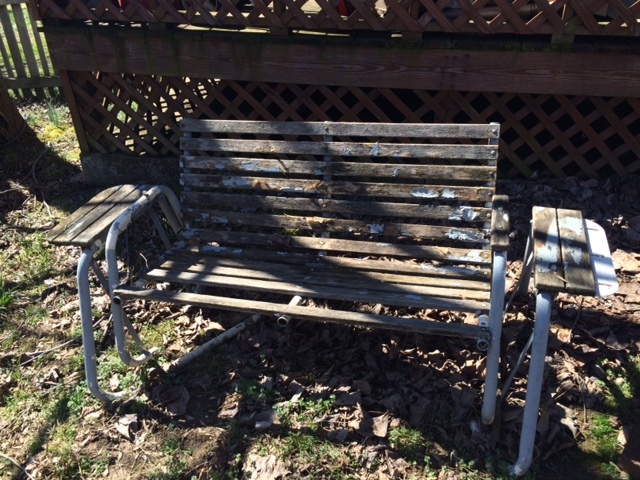 So last weekend, my husband went out and got the bolts off and disassembled the bench. Now, I can clean it, paint it, and install a new seat. Once I was done cutting the wood, my husband put the miter saw in the attic, since we won’t be needing it again for a while. 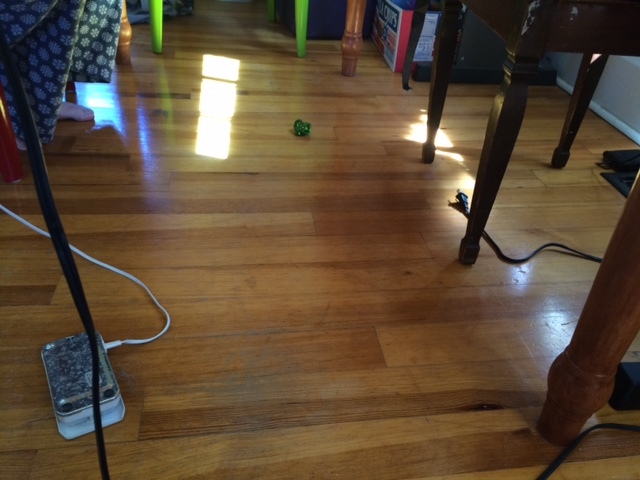 Then he kindly vacuumed under the table for me. With no lumber or saw under the table, someone sitting at the table can now actually scoot their chair under the table! See how much better it makes the whole room look? Small steps, people, small steps.